Manual Orthographics - What is orthographic drawing? First look at the cube from the different angles, such as the top also known as the plan or bird’s eye view or, as if you were looking down on the cube from above. Then look at the front elevation (front view) and the side elevation (side view). 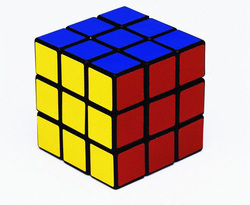 As all sides of a Rubik cube is equal therefore the top (bird’s eye view or plan), front elevation and side evaluation will all look the same.